What year is it? 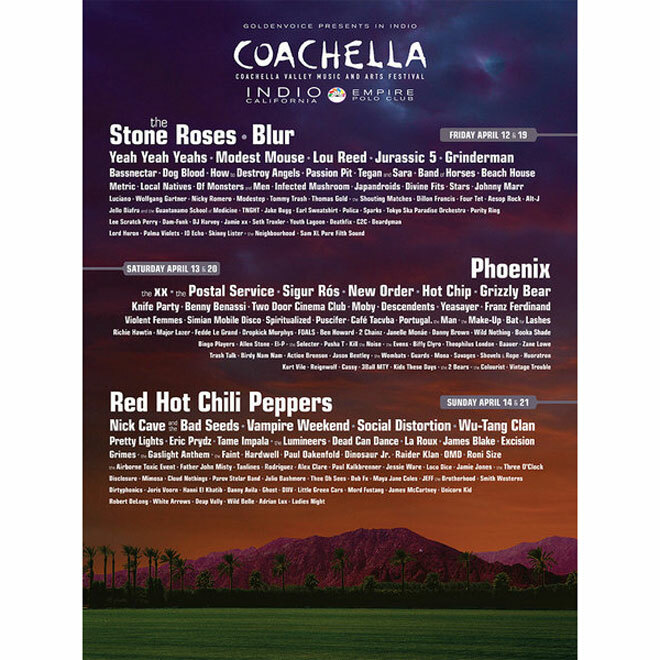 Looking at the lineup for Coachella 2013 it’s awfully hard to tell. Announced late yesterday, the headliners for this year’s festival include such up-and-comers as the Stone Roses, Blur, and the Red Hot Chili Peppers (who some concertgoers probably saw at Lollapalooza — 21 years ago). The lineup is filled out by other war horse acts like Wu-Tang Clan, New Order, the Descendents, Dead Can Dance, and the Violent Femmes. Veteran acts have always been part of Coachella, but this year the reliance on old timey performers has usurped any sense that the multi-weekend festival is devoted to new music. Sure, some of these throwbacks are reuniting or haven’t played the United States in years (Stone Roses, Blur), but hasn’t this generation minted any music stars of its own? Or have festival organizers, in their bid to be inclusive, lost their urge to be relevant? The fantasy Coachella lineups created by music nerds (something of a tradition, by now) and even the fake all-hologram edition of the music fest feel more inventive and inspired. We’re glad to see Passion Pit and Yeasayer in the mix but we’re even more interested in the lush, earthy pop of Lord Huron, the electronic Chinoiserie of IO Echo, and the screaming garage blues of Hanni El Khatib — all local acts buried in the lineup. If you’re going to Coachella, scan the small print at the bottom of the roster. That’s where the fun is. Remaining tickets for Coachella, which takes place the weekends of April 12-14 and April 19-21 at the Polo Grounds in Indio, go on sale Jan. 29.